Accounting fraud and how it has affected business practices both in the U.S. and internationally has never been of greater importance than it is now. 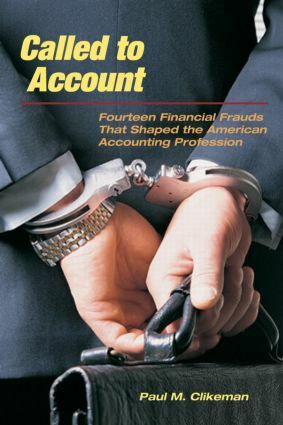 Called to Account describes fourteen financial frauds that influenced the American public accounting profession and directly led to the development of accounting standards and legislation as practiced in the US today. This entertaining and educational look at these historic frauds helps enliven and increase understanding of auditing and forensic accounting for students. Chapters describe the tricks fraudsters such as "Crazy Eddie" Antar and "Chainsaw Al" Dunlap used to fool their auditors. Readers will learn how MiniScribe employees disguised packages of bricks as inventory; how Equity Funding personnel programmed the company’s computer to generate 64,000 phony life insurance policies; and how Enron inflated its profits by selling and then repurchasing money-losing assets. Complementing these chapters on high-profile crimes and criminals are chapters that trace the development of the public accounting profession and explain how each scandal shaped current accounting practices. Designed to complement dry, uninvolving auditing and advanced accounting texts with an engaging narrative, Called to Account also includes discussion questions and a useful chart which shows instructors and students how each chapter illustrates topics in leading accounting and auditing textbooks.